Want to ace your DHSMV license exam? Several types of Florida DMV practice tests are available to help you prepare for your DMV written exam. You can also take advantage of other preparation resources to help get ready for the Florida written exam. See our sample questions at the bottom of the page to get a view of the types of questions you'll see on your exam. When you get a new license, you are going to have to pass a written exam in order to be eligible for a Florida driver's license. With so much riding on this exam, you'll want to be as prepared as possible to pass it. Luckily, there are several practice tests available to help you prepare for your Florida written exam. Permit Test – In order to get a learner's permit in Florida, you must complete driver's education and pass a written exam. Practice tests are available online and on paper to help you get ready for the exam. Drivers that are new to Florida and not eligible to transfer their out-out-state license. Road Sign Test – Written tests for drivers in Florida are made up of questions regarding road rules and road signs. This type of practice test is available to help you focus in on the road signs section of the exam. Spanish Language (Examen de Practica) – These practice tests are available to help the many drivers who speak Spanish as their first language prepare for their DMV written examination. Commercial Driver's License (CDL) – Applying for a CDL is part of big career decision that you have made. CDL prep tests will help you practice for the important CDL written exam. CDL Endorsements – Depending on what you are going to be transporting as a commercial driver, you will be required to apply and test for certain classes of CDL endorsements. You can use these practice tests, typically offered online, to help you prepare. Motorcycle License – In order to get your motorcycle license, you will need to pass a written exam that is separate from you driver's license exam. Use this type of practice test to train for the motorcycle license written exam. Driver's Prep Course –This multimedia course, comprised of interactive and video modules, is great for the visual learner. 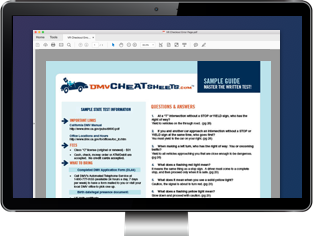 DMV Study Guide – Downloadable and ready to print, these straightforward and concise guides can make it easier for you to study and prepare for your exam. Your driver's license exam will consist of 50 questions covering the rules of the road and Florida road signs. In order to retake the test, you will need to pay a $10 retesting fee. Brake only when necessary to avoid a crash. Honk your horn and brake firmly. Stay calm, slow down, and gently pull back to allow a safe distance. Set the parking brake first then shift into Park. Shift into Park and set the parking brake. Shift into Park and leave the brake disengaged.